The Shell-Shocked Nut is East Village Dance Project's annual alternative interpretation of the Nutcracker. Originally conceived in 2012, the show started as an informal showing with students from the studio, but swiftly grew into a full-scale production, featuring an intergenerational cast of student dancers and professional artists. The show, conceived and directed by Martha Tornay, and co-directed by Victoria Roberts-Wierzbowski, features sections choreographed by other local, national (and international!) artists, making it a truly collaborative, community project. The Shell-Shocked Nut has been presented at La MaMa Experimental Theater annually since 2013. Watch video clips from our December 2015 performance. Join us for our 2018 production! The Shell-Shocked Nut upends the classic structure of E.T. 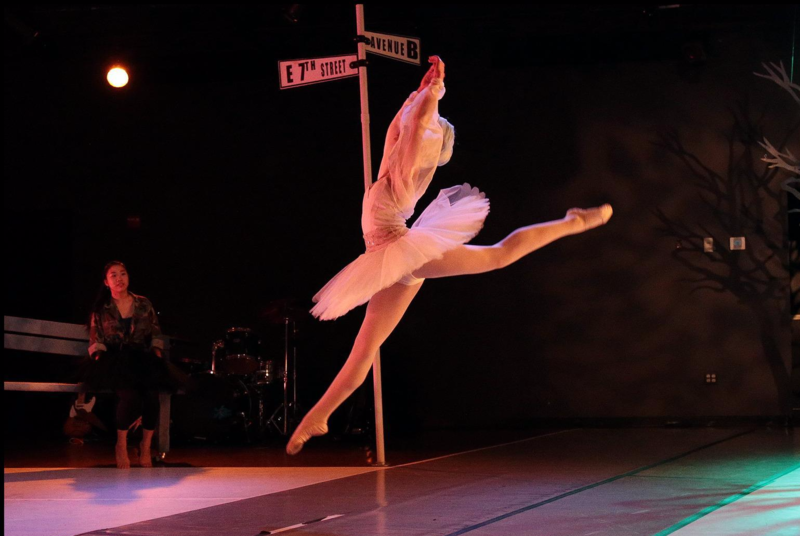 Hoffman’s Nutcracker, relocates it in the East Village, and uses a cast of lively characters to explore themes of loss and recovery. A war veteran and a wandering child take us on a journey through the iconic and the everyday of the East Village – stopping at Tompkins Square Park, Economy Candy Store, the aisles of a corner bodega, the interior of a East Village home, and much more. Check out photos and cast lists from past shows! FEATURING: Shaina Branfman, Lauren Kravitz, Jessica Mantell, Kotone Ogasawara, Bryan Strimpel, Gilbert Reyes and EVDP youth students with live music performed by students from ICE High School.